← When You Bleep Out The Uckin And We Can Still Hear The F and The G? You’re Not Foolin’ Anyone. I come from a long line of letter writers, and while I live an almost paperless life-I still send thank you notes and birthday cards by mail. While I was growing up my mom wrote letters every week, with an old fountain pen to her parents and brother and sister. They wrote back. Including her dad. I remember her admonishing me not to shake the table as she wrote her letters. Now she e-mails like a fiend but still sends love notes by mail. Its wonderful when they arrive. Your assignment is timely–its almost Valentine Day! Oh Jane! The picture reminds me of the YouTube movie: Marcel the Shell with Shoes On. Have you seen it? It is pure delight. Also, it reminds me of “World’s Smallest Post Service”. Another lovely idea. Just like your post. I wrote about this last year. I remember my mom getting snail mail from India from her parents. She would sit in the corner and smile and I would catch her reading the letter at different times of the day. There is a certain excitement in receiving a letter. Snail mail carries with it the touch, the smells of a certain place and loved ones. Great way to inspire us Jane! I have re-adopted the letter-writing myself lately, as a means of keeping more in touch with the people back home since I’m working abroad now. Strictly speaking, I only write letters to one person, but I have taken it to send each and every one of my friends a snail-mail birthday card. There hasn’t been too much response, unfortunately, but I still had fun doing it :). Does sending a check for a medical bill count? Snail mail, after all. Well, fine, if you’re going to be a stickler. I have two cards sitting on my desk since Christmas from people who do not have computers. This year I (gasp) even emailed my Christmas cards – but I get points for having created them myself, right? So I’ll take your challenge and right now I will answer at least one of those people. When I was a teenager my cousin and I would write long, long letters requiring multiple stamps to each other. I wonder what the heck we had to tell each other now. I couldn’t do that many pages if I kept a minute-to-minute journal now. In your honor, I will include letters with the Valentines I send. I just mailed a thank you card yesterday! 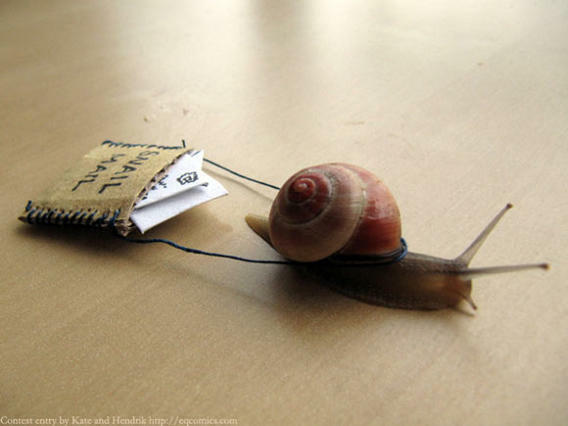 You’re right: Everyone loves snail mail. I will, I will! Can this be like a chain letter, where if I agree to do it, I’ll reap the benefits, too?? As a matter of fact, I’m finally getting my Christmas boxes out. What? Christmas passed a month ago? Crap. Great idea! I LOVE snail mail! I used to write to my Mom every Saturday. After she died I found all my letters in a pile, held together by a rubber band. Made me cry. Maybe we could each do a campaign like that this year for someone we love who’s a bit lonely with the winter wearing on them. OK. I wrote a 2 page letter to a friend that’s been ill…it will be mailed with a snail mail stamp tomorrow morning. Made me feel good…will make her feel good too. all for 47 cents. You are inspiring! 2 pages? Thanks for taking the challenge to a whole other level! I received a snail mail today from my best friend Laura. She sent me a card and a picture of all the ugly snow in front of her house in Connecticut. She’s really good about writing “real” letters. I love the look of her handwriting. So, I’m inspired to snail-mail her back, which gives me a good excuse to get out of the house and go card shopping. And I can take some pictures for my other blogs. I agree with you, Jane. It does make you feel special that someone took the time to write to you after thinking about you. It’s almost like opening a Christmas present. Nothing quite like a real letter, on real paper, with a real stamp. You can hold it, cherish it, save it – a genuine delight. I always prefer a paper letter in my metal mailbox. Love the disclaimer at the end. I’ve been doing this once a week (sad) since I decided not to send holiday cards this year. One letter a week to someone. And damned if my hand isn’t out of shape. Sheesh. Hurts after a page.